Editor of the Beacon Hill Blog. No sign of the dentist’s office anymore; this construction is bringing a brewpub to North Beacon Hill. Photo by Wendi Dunlap. Remember when the Rainier brewery was open down the hill from us in Sodo, and we could smell the beer brewing up here on North Beacon every day? It’s been a few years since then, but beer brewing is returning to the vicinity, and now it’s even closer! 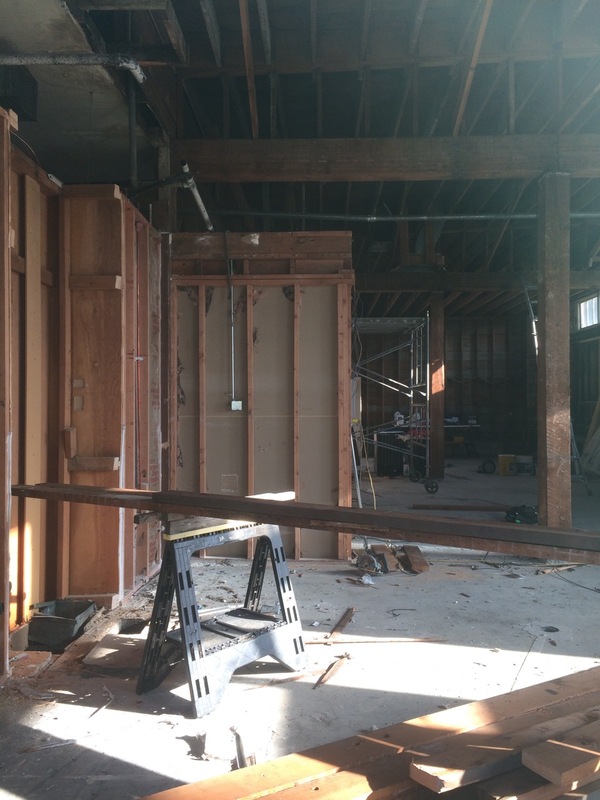 Beacon Hill’s first brewpub, Perihelion Brewery, will open later this year. The pub will be located across S. McClellan from the Red Apple, in the building that houses Salon Nouveau. The salon is staying; the pub is taking over the former dentist’s office on the west/16th Ave. S. side of the building. A few days ago, the BHB was out there peering through the windows to see the progress. (And it’s nice to see the windows uncovered, after all of those years they were covered up!) 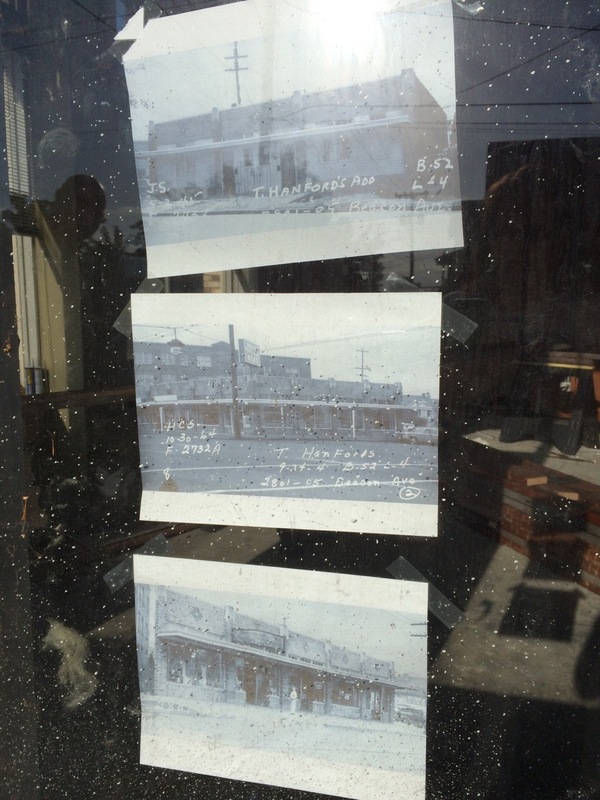 We were happy to see that Owner/Head Brewer Les McAuliffe and Assistant Brewer Hunter Jaworski posted photos in the window showing historic views of the building. (Maybe the photos will be inside after the pub opens?) The space is small, but looks roomy enough for a cozy neighborhood hangout. These old photos show the appearance of the building years ago. It looks very strange without the big trees on Beacon. Photo by Wendi Dunlap. You can find all the beer-geek details about the new most-local of brews at Seattle Beer News, and follow the pub on Twitter at @Perihelionbeer. Click through to see this bigger! Panoramic view of the construction in the South Lot of El Centro de la Raza. Photo by Wendi Dunlap. 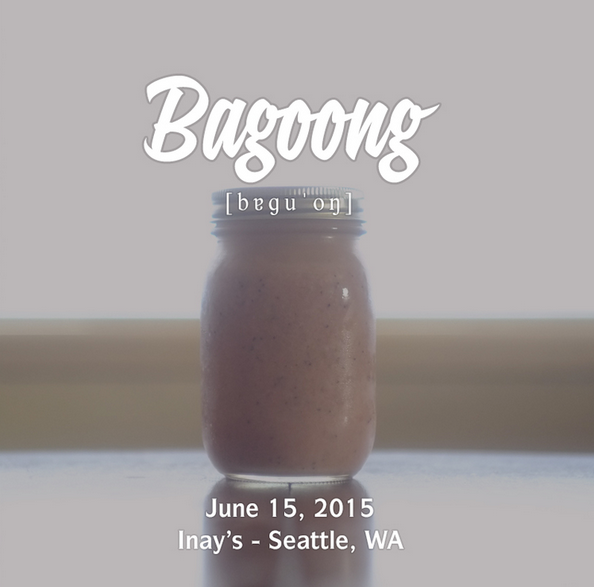 “Geo Quibuyen and Chera Amlag, the people behind the successful monthly pop-up Food & Sh*t, held every third Monday at Inay’s on Beacon Hill, are betting that Seattle diners are ready to handle some of the Philippines’ strongest, fishiest flavors. The event is a prix-fixe 5-course tasting menu dinner. All ages are welcome. Reservations and advance payment are required; go here to reserve your space. The Station Coffee House has been serving up coffee and supporting neighborhood arts for five years now (can you believe it?). To celebrate, they are hosting a free, all-ages Block Party on Saturday, June 20 from 2-9 p.m., with local food and beer, kids’ and families’ activities, live performances and more. 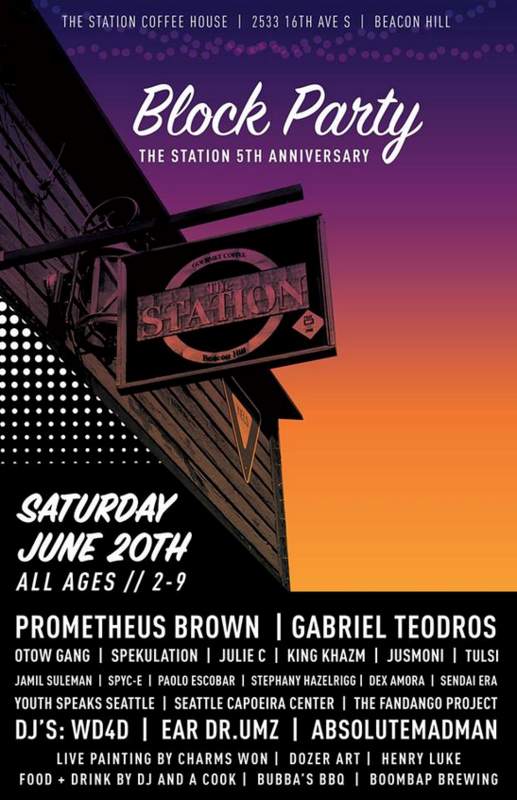 A small selection of the acts to be featured includes: Prometheus Brown, Gabriel Teodros, Otow Gang, Spekulation, Julie C, King Khasm, Jusmoni, Tulsi, Seattle Capoeira Center, The Fandango Project and many more. DJs will include WD4D, Ear Dr. Umz and Absolute Madman. The Station is located at 2533 16th Ave. S., across from El Centro de la Raza. Hi, all. I am aware that comments aren’t working at the moment. I’m looking into it and will get it fixed as soon as possible. Thanks for your patience! 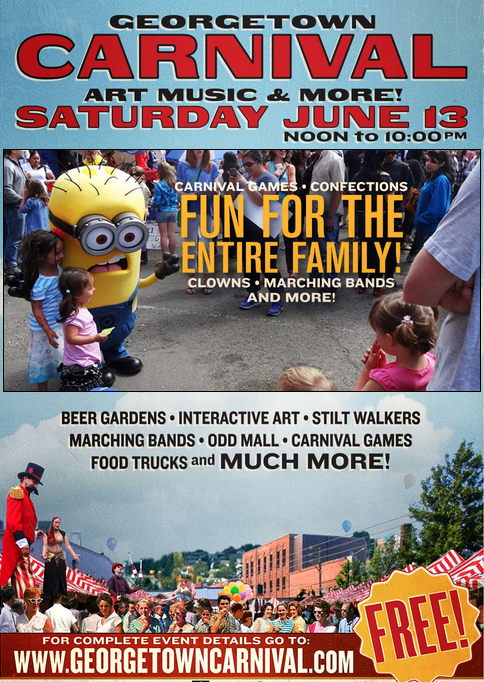 Just down the hill from us, the Georgetown Carnival will happen from noon to 10 p.m. this Saturday, including four separate stages featuring a variety of music and entertainment, plus the ever-popular power tool races on Airport Way South. The event is free of charge and all ages are welcome. The carnival will mark the first use of Georgetown’s new “festival street,” similar to Beacon Hill’s Roberto Maestas Festival Street next to Beacon Hill Station. SDOT Director Scot Kubly will speak briefly at 1 p.m. to dedicate the street and thank those involved. Find out more info at the Georgetown Carnival website. The North Beacon Hill Council (NBHC) Board will be meeting from 6:30 to 7:45 p.m. on Monday, June 8 at the Beacon Hill Resource Center. The Resource Center is located in the lobby of the Beacon Hill library at 2821 Beacon Ave. S. This meeting is open to the public. What happened to the Beacon Hill Blog? This is a post I’ve been meaning to write for a long time now. The blog went on hiatus in 2014, and I’ve gotten a lot of emails since then from people asking “What happened to the blog? Why don’t you post something?” When you get right down to it, the blog has been on hiatus for a variety of reasons, both practical and personal, and this story is not terribly unique. There are a few things I should probably clarify to get started. The blog is not run by the city. I started it with Jason Simpson in 2008 because I personally felt the community needed it. But we never got any support from the city, or the North Beacon Hill Council, or anything like that. The “seattle.wa.us” domain name doesn’t indicate government ownership, though I can see why some people have been confused about that. The blog never brought in any income to speak of. We did have some ads, but most were just Google ads that didn’t really pay anything. Occasionally we had more ads, but never to the point where anyone involved could be paid any sort of reliable income. I did pay one contributor for a few articles, but it was unsustainable. We could do this because we had other means of support at the time. When the blog started, Jason and I were married, and both of us were employed. I had a job and he had a great job. There was no real reason for the blog to earn a ton of money. I wanted it to become self-supporting someday because I wanted it to become my full-time job, and I believed that Beacon Hill could support a blog, but I knew that would take a while. I don’t have that support any more. Suffice it to say that the marriage ended. A while later, my employment situation got drastically worse. And yet, I continued keeping the blog running, as much as I could, while trying to earn money, attend school, and more. I won’t go into all the details, but the stress of doing that took a major toll on my health. At the end of 2013 I decided I needed a break from the BHB over New Year’s. And as 2014 began, I realized I needed to take a break from the blog entirely. I never intended it to be permanent, but it absolutely did need to happen. So, here we are now. It’s been a bit over a year, and I’ve been thinking recently more and more about how to resurrect the blog. (As have others on Facebook and elsewhere.) People have offered to help over the last year, and I have followed through with some but not always with others. Most people get excited about it but then never get back to me. Without the funding to allow me to devote enough time for this, I can’t do what I used to do here by myself. I still am not in a financial situation (not even close) that would allow me to work full-time on this. But I want to make it clear that the blog is still here, still alive, and I am absolutely willing to print submissions. They have to meet editorial guidelines, most of which are probably common sense. But if you want to write something up about an Artwalk or the Beacon Hill Festival or new public art, that’s great! I’d love that. I’m also open to talking to people who want to take on regular “beats,” and who aren’t just interested in beating the drum for a particular pet cause. I am going to try to post a bit more when I can. I have pretty high standards, which makes it a bit more difficult, sometimes. Do I take the time to meet my own journalistic standards, or just get something online and get back to the business of making a living doing something else? Beacon Hill community members, business owners, and so on: a blog like this cannot exist without actual support. Whether that support comes from other employment to pay the bills (as it once did for the BHB), local businesses buying ads (in enough volume), paid subscriptions through something like Patreon, forming a non-profit and applying for grants, or a critical mass of community members volunteering — the support part is vital. This is why so many local blogs and printed publications have gone under. When a blog relies on one or two people to keep them going, they are one major life change away from ceasing to publish, unless there is other support to keep them going. 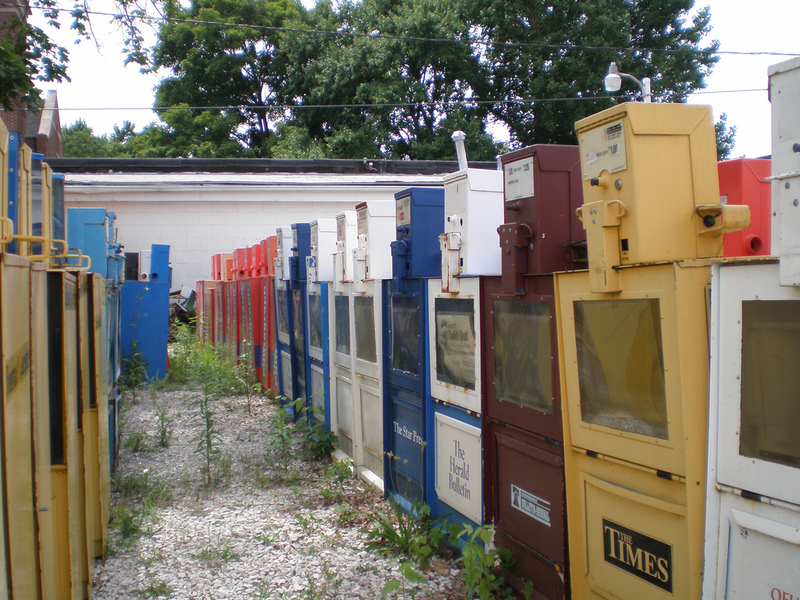 There is not a lot of support for journalism these days, despite the large audience. Are you willing and able to change this? Let’s talk about it here in the comments. 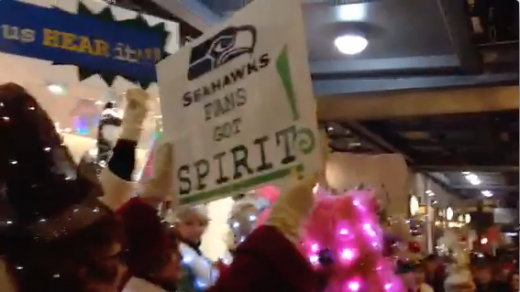 Click on the picture to see a QuickTime video of Beacon Hill’s own Beaconettes paying tribute to Christmas, the Seahawks, and Macklemore at the Great Figgy Pudding Caroling Contest.